Phu Langka Forest Park is home to a gorgeous viewpoint on its namesake mountain between July and December, when DokKhlongkhleng, or Indian Rhododendrons, display their deep violet petals whilst in full bloom. 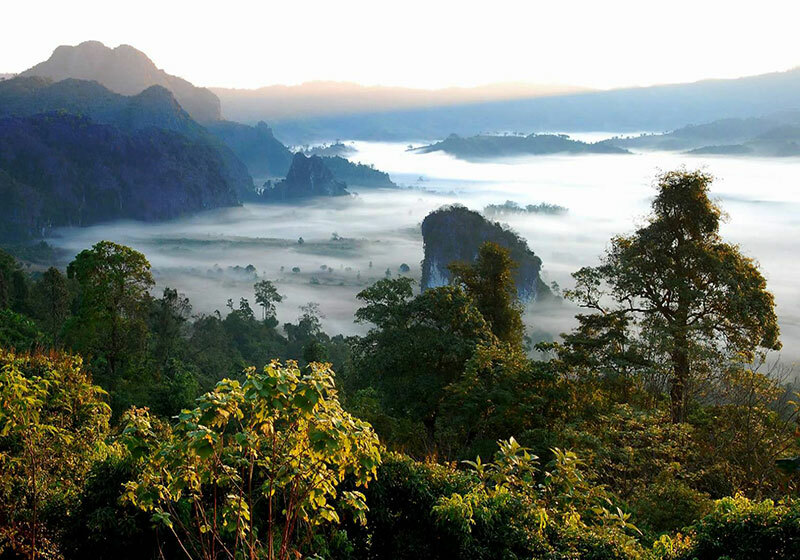 Visitors may also admire the unique scenic view at the summit of the mountain 1,700 meters high, observing as swathes of fog envelope Phayao province below. It is said that on full moon days, a white aura can be observed at its summit, hence its nickname, Fin Cha Bo, or angel shrine. The summit of PhuLangka is not the only attraction –waterfalls such as Namtok Phu Langka, a million year-old stone terrace (LanHinLan Pi), and even traces of communist hideouts are worth exploring as well. Accommodation and camping areas are available for guests. To get there from Phayao Province, take Highway No. 1021, passing AmphoeDokKhamtai and Amphoe Chun until reaching Amphoe Chiang Kham. Then, merge onto Highway No. 1148. The total distance from Phayao Province to PhuLangka Forest Park is around 120 kilometers. A 4-wheel-drive vehicle is a must for this journey. Short Description: The Phu Langka Forest Park, or Phu Lang Ka Forest Park, is a protected area of the Phi Pan Nam Range located in Chiang Kham District and Pong District, Phayao Province, Thailand.